Forget the muffin, the hottest thing in baking, be it home or retail, is the cupcake. If you bake a muffin, for Pete’s sake, call it a cupcake to get people to look at it. Do a google search for “cupcake mania” if you don’t believe me. Somebody named “Bakerella” put little cakes on candy sticks and invented “Cake Pops”. She has even written the book on the subject. Cake Pops are “popping” up everywhere –Starbucks even has a version of them now in the pastry case. I bet there will be Bundt Pop Pans very soon! You watch. 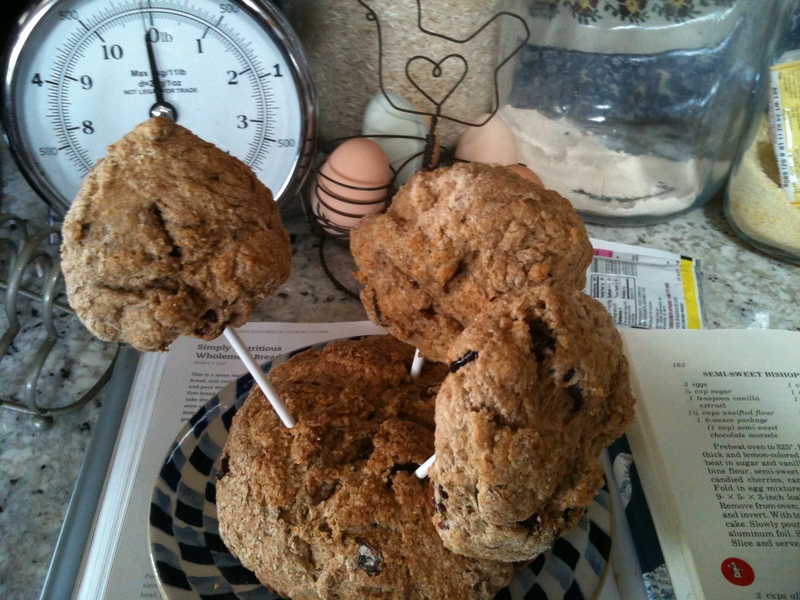 But until then, and, in honor of Bakerella, I made Irish Soda Pops. I took my favorite ISB (Irish Soda Bread) recipe and merged it with Darina Allen’s Ballymaloe Cookery School recipe for something called “Spotted Puppies” (which are mini “Spotted Dogs” of course! Note: the only difference from the “Stripy Cat” recipe published online in the link is the chocolate. Obviously, small ones would be called “Stripy Kittens”…) and I put them on a stick. 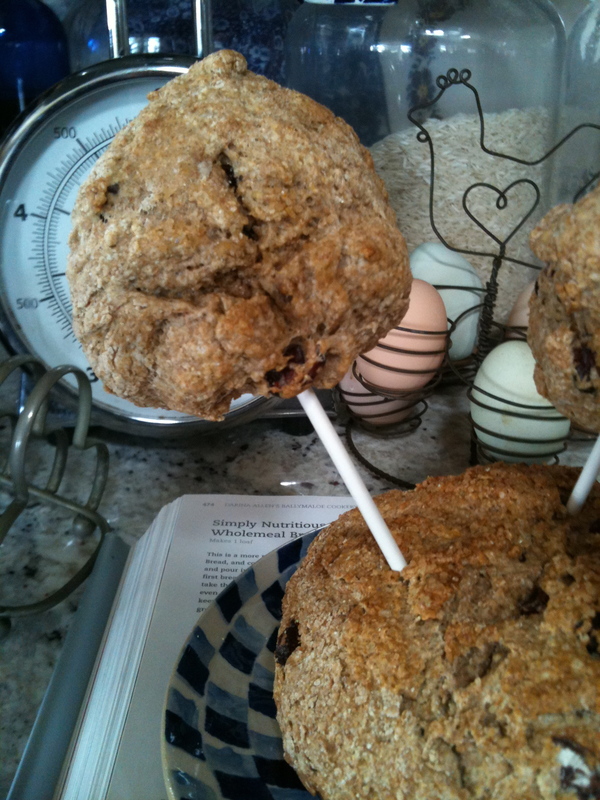 Even though Irish Soda Bread is quick bread and not cake, I am in Cake love. Additionally, you will need four candy sticks or rosemary stalks minus the needles for the pops. Sift together the flour, baking powder, baking soda, sugar and salt. Mix in the butter with your hands until the texture is pebbly. Add in the dried fruit and coriander, if using. Stir in the buttermilk and when the dough comes together divide it in half and put the first half on a baking tray lined with parchment paper, shaped into a flat round and cut a cross in the top. Cut the remaining half into quarters and put the 4 smaller dough balls onto the same baking tray and cut a cross in each. Bake for approximately 20 minutes and remove the pops, then return the small loaf to the oven and bake approximately for another 15 -20 minutes more ’til done. Insert the pop sticks into the small “pops” while they are cooling and stand them up in the small loaf for serving. Posted in Recipes - from Karen England - Edgehill Herb Farm, Uncategorized. The Hubby LOVES these Irish Soda Pops. He takes one in the morning with his coffee on his way to work and today when we talked on the phone he was eating his ISP and said they were “perfect”. Man o Man! High praise indeed.